LG doesn't seem intent on waiting for large industry events to announce their wearable products. Last year the company announced their LG G3 Stylus and the LG Watch R shortly before the beginning of IFA, and today we're seeing a similar announcement only a few weeks before the start of Mobile World Congress. 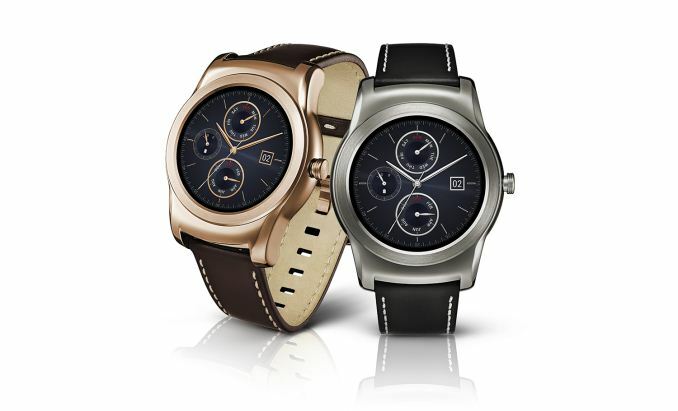 Today's announcement is the LG Watch Urbane, a smartwatch that is described as a more premium version of the LG Watch R. While the LG Watch R targeted users who were interested in something to augment their fitness routines, the LG Watch Urbane targets people who want something with a design and construction more similar to a traditional watch. The internal specifications of the LG Watch Urbane are the same as the LG Watch R. It's powered by Qualcomm's APQ8026 which is a quad core Cortex-A7 SoC running at 1.2GHz paired with an Adreno 305 and 512MB of RAM plus 4GB of NAND. It retains the IP67 rating for submersion in water up to 1 meter deep for 30 minutes which has become standard across all of LG's wearables. The display is also the same circular 1.3" 320x320 plastic OLED display. What differentiates the LG Watch Urbane from the LG Watch R is its premium build, with a stainless steel body, a thinner bezel around the display, and a stitched leather strap. LG is yet to provide information about pricing or when it will be available for sale, but with MWC on the horizon we're likely to get more information about the LG Watch Urbane soon. How dare a company try to target products to consumers with different tastes, and (gasp!) maybe make a profit which will help fund further improvements. Nice look, but the hardware is all wrong! Why the hell does a watch need a quad core 1.2GHz CPU and half a gig of RAM? Jesus, it's a timepiece, not an aircraft guidance system. Uhh, these things are NOT timepieces. If you want a timepiece Casio or Timex (or Rolex or Patek Phillipe) will happily sell you one. Still, quad core is a bit of an overkill no? It's already an overkill on smartphones.